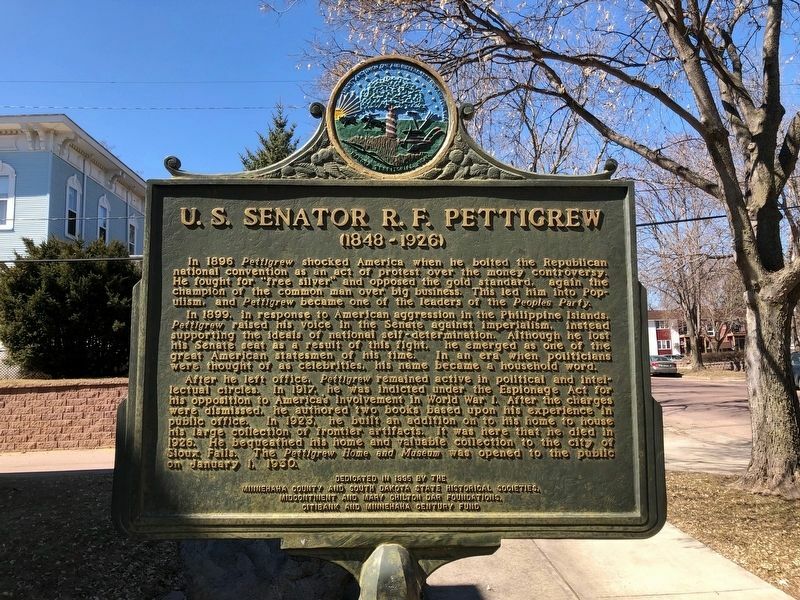 Richard Franklin Pettigrew was 20 years old in the spring of 1869 when he first came to Dakota Territory from Wisconsin as a member of a government surveying party. Pettigrew decided to settle in Sioux Falls, and join in the building of a city. With money made from surveying and with his unusual leadership abilities , Pettigrew quickly rose to prominence. He was elected to the Territorial House of Representatives in 1872. He was, however, unseated after a bitterly fought contest. In 1876 he was elected to the Council, the upper chamber of the legislature, and was easily re-elected in 1878. As a legislator, Pettigrew zealously promoted the interests of his district. Because of his aggressive style and tall, thin stature, he became known as the "Pickerel Statesman". Dakota to the Union in 1889. Pettigrew was elected to the United States Senate. Among his achievements in the Senate was legislation which created the national forest preserves. Because he believed in the worth of the individual over the corporation, he fought for a tariff which benefited farmers and working people. He was re-elected to a second term in 1895. In 1896 Pettigrew shocked America when he bolted the Republican national convention as an act of protest over the money controversy. He fought for "free silver" and opposed the gold standard, again the champion of the common man over big business. This led him into Populism, and Pettigrew became one of the leaders of the Peoples Party. 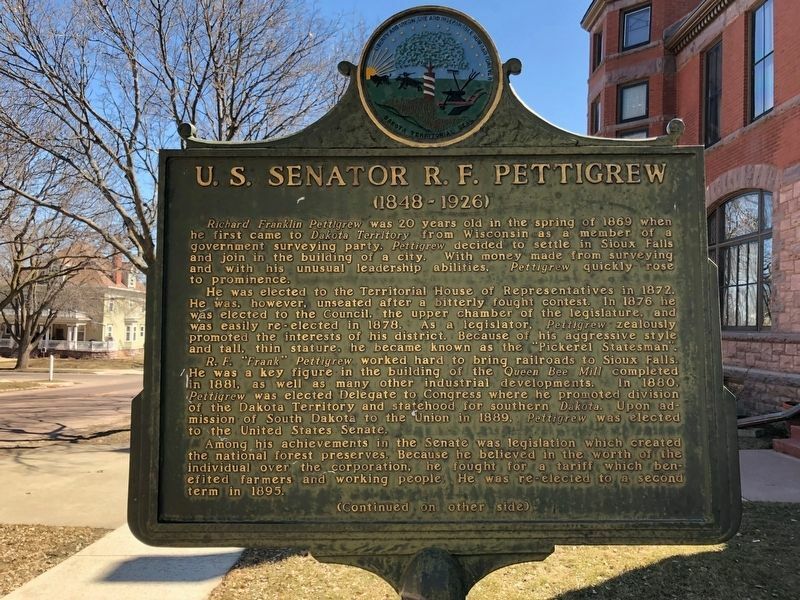 In 1899, in response to American aggression in the Philippine Islands, Pettigrew raised his voice in the Senate against imperialism, instead supporting the ideals of national self-determination. Although he lost his Senate seat as a result of this fight, he emerged as one of the great American statesmen of hiss time. In an era when politicians were thought of as celebrities, his name became a household word. World War I. After the charges were dismissed, he authored two books based on his experience in public office. In 1923, he built an addition on to his home to house his large collection of frontier artifacts. It was here that he died in 1926. 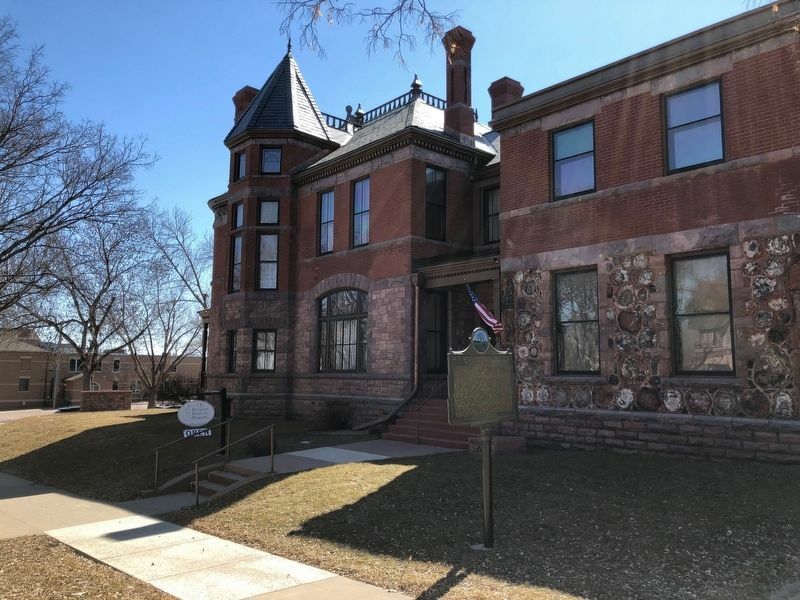 He bequeathed his home and valuable collection to the city of Sioux Falls. The Pettigrew Home and Museum was opened to the pubic on January 1, 1930. Erected 1995 by Minnehaha County and South Dakota State Historical Societies. Midcontinent and Mary Chilton DAR Foundations, Citibank and Minnehaha Century Fund. Location. 43° 32.911′ N, 96° 44.097′ W. Marker is in Sioux Falls, South Dakota, in Minnehaha County. Marker is on W 8th Street 0.1 miles west of S Duluth Avenue. Touch for map. Marker is located at the Pettigrew museum. Marker is at or near this postal address: 623 W 8th Street, Sioux Falls SD 57104, United States of America. Touch for directions. Other nearby markers. At least 8 other markers are within walking distance of this marker. Prehistoric Prayer Rock (here, next to this marker); Quartzite Paving Stones (approx. 0.2 miles away); The Hanging of an Innocent Man (approx. 0.4 miles away); Divorce Capital (approx. 0.4 miles away); Cigar Manufacturing (approx. 0.4 miles away); President Woodrow Wilson (approx. 0.4 miles away); Dakota Iron Store (approx. 0.4 miles away); Fort Dakota, D.T. (approx. 0.4 miles away). Touch for a list and map of all markers in Sioux Falls. More. Search the internet for U.S. Senator R.F. Pettigrew. Credits. This page was last revised on April 14, 2019. This page originally submitted on April 10, 2019, by Ruth VanSteenwyk of Aberdeen, South Dakota. This page has been viewed 34 times since then. Photos: 1, 2, 3. submitted on April 10, 2019, by Ruth VanSteenwyk of Aberdeen, South Dakota. • Andrew Ruppenstein was the editor who published this page.